Does Jobs Have Place In History Beside Edison, Ford? Comparisons can be drawn between the former Apple CEO and other great innovators like Thomas Edison and Henry Ford, both technological titans in American history. Does Jobs Have Place In History Beside Edison, Ford? 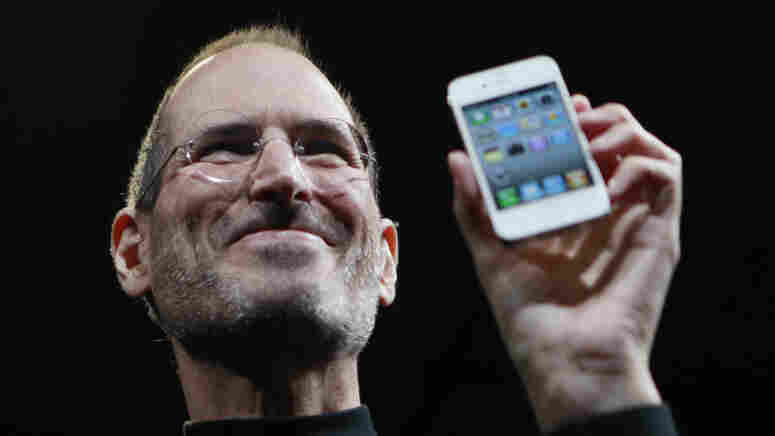 Steve Jobs stepped down this week as CEO of Apple after running the company for nearly 25 years. The first Macintosh computer, the iPod audio player and most recently the iPad are just a few of the products Jobs created that have changed the way millions of people live their lives. Comparisons can be drawn between Jobs and other great American innovators like Thomas Edison and Henry Ford, both technological titans in U.S. history. The Henry Ford Museum just outside of Detroit is a shrine to all sorts of American innovation. The museum includes Edison's laboratory complex and the Wright Brothers' original bike shop. Marc Greuther, chief curator at the Henry Ford Museum, told weekends on All Things Considered guest host Laura Sullivan that a common ground between Edison, Ford and Jobs is their understanding of latent needs. "No one was banging on the door at Menlo Park requesting electrical light," Greuther says. "[Similar] to the iPhone, no one was wandering around clamoring for a personal computer in their pocket." Little did we know that's exactly what we wanted, Greuter says. Jobs and his collaborators, much like innovators in the past, figured that out and said, "You don't think you need this, but you're going to love it." "That for me is a signature part of innovation," Greuther says. Though Edison was most certainly an inventor, both he and Jobs can be considered a mixture of both inventor and innovator to current technology. Edison was also acutely aware of how ensnared a person could get in imagining complex devices that couldn't be produced, Greuther says. "If we can think of a typical inventor we could imagine someone who is eager to create a device but who then didn't necessarily have any plan for taking it further," he says. "Edison was adamant that anything he invested his time in actually had some possibility in the marketplace." Bringing a product to market is one area where Jobs reigned supreme. At his product releases, wearing his trademark black turtleneck and jeans, Jobs' stage performance and presentations became a hallmark of the Apple brand. In the early days of the Model T, Ford was equally intertwined with the company and its products, Greuther says, as was Edison. "There was a sense that these were all products that were all very close to the names associated with them," he says. "They weren't just goods with a brand stamped on them; so I think that follows through to Steve Jobs and Apple as well." Great inventors and innovators of technology no doubt share some similar traits, tenacity among the most prominent, Greuther says. Edison, Ford and Jobs also all had a sense of vision and the ability to articulate that vision. "The beautiful thing is that you can analyze this to a high degree, you can start partitioning out all manner of behaviors and traits," he says. "I think that's part of the magic of how we encounter visionaries and leaders of this sort. ... There are extra elements in there that [are] hard to pin down."